A senior obstetrician once said that obstetrics is “98% boredom and 2% sheer terror.” During my fourth birth, I experienced for the first time in my life what it feels like to be part of that 2% when my baby’s oxygen supply was suddenly cut off during the delivery. Thank G‑d, in the end my birth ultimately ended safely and easily, largely because the midwife on duty that night at Jerusalem’s Shaarei Tsedek Hospital happened to be none other than Chana Deevon. 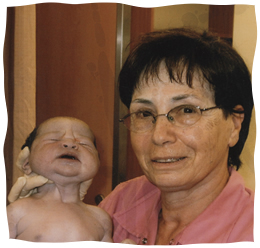 With forty-six years of midwifery experience and over 30,000 babies under her belt, Mrs. Deevon is almost certainly the most prolific and senior midwife in all of Israel. After the birth, the younger midwives who saw the emergency procedure performed so effortlessly by Chana Deevon explained that I had been extremely fortunate. A less experienced obstetrician or midwife, they pointed out, would not have had the experience to act so decisively and effectively in order to give my birth a happy ending. Afterwards, Chana Deevon stayed with my husband and me, and reminisced about what had inspired her to dream of becoming a midwife for as long as she could remember. She recalled how she was born in Halberstadt, Germany in 1938, where her father, the fifth rabbi from the distinguished Auerbach rabbinic dynasty, served as a congregational rabbi. By that time, Hitler had made it illegal for midwives to deliver Jewish babies, but Mrs. Deevon’s mother went into labor with her and her twin brother in the middle of the night, so the local midwife reluctantly agreed to help her when she was reassured that she would not be detected under cover of darkness. It turned out that Chana Deevon and her brother would be the last Jews born in their city, where a vibrant Jewish community had existed for hundreds of years. Soon after she was born, the city’s entire Jewish community was transported to the Teresenstadt concentration camp, and Rabbi Auerbach and his wife were on one of the last trains providing transportation for Jews out of Germany, on their way to Palestine with their four young children, ages two, one, and twins aged three months. Today Shaarei Tsedek is Jerusalem’s most popular delivery room. They have state of the art medical equipment, several midwives on duty at all times, and there are attending obstetricians 24 hours a day. Nowadays, though, the challenges are different. Back then there were only 100 deliveries a month, now there are close to a 1,000! That means that today there is much more pressure on the midwives than ever before. Chana Deevon is especially proud that this same 21-year-old granddaughter volunteered with her for two years in the Shaarei Tsedek delivery room, and was so impressed by the first birth she attended that she decided to start training to become a midwife in order to follow in her grandmother’s footsteps.